When it comes to successful home party presentations, nothing beats getting the customers involved in everything that is going on. When people are having fun, they tend to stick around and buy more product. That is why you need to have a good home party plan game at your disposal to keep the party moving along. One of the best party games to play when trying to sell products to customers is an Easter egg hunt. You need to get to your party location early and place the clues before your guests arrive. If this is done properly, then you will have people laughing and looking at your products to see what they want to buy next. Each of your products has a little round sticker on it of a different color. Even though this game has an Easter theme, you could play it in some variation year round! When you are putting together a home party plan game, the main thing to remember is that you need to keep it as simple as possible. When it is simple, it is easy for you to set up and it is something you can do over and over again. The easiest way to do a party Easter egg hunt is to get colored plastic Easter eggs and tell your guests that they have to find the one “egg” of their color to win what is inside of the egg that they were issued/drew from a basket. The best way to do it is to tell your guests that they get one egg and in order to win the prize inside of their egg they buy the item that has their sticker color on it. Each egg should have a small piece of paper in it that either says “Not a Winner” or mentions a door prize that they have won once they decide to buy that item with the matching “egg” color on it. Make the distribution of these pieces of paper completely random to keep things interesting. To keep things interesting, give a game time limit of 10 or 15 minutes. You can limit the number of egg colors to three to make things fair. After the demonstration is under way, the people can start to open their eggs and see what prizes they won. Then they will start to look closer at the products to find their egg colored sticker! If you really want to make it fun, then encourage your guests to create alliances with other guests and have them work together. These kinds of bonds often inspire customers to stick around longer so they can talk to their new friends. You should limit the alliances to only allow duos. Once a player has found her egg colored product and decided to buy it, she may grab another egg and play again…. You can even include a home party bookings bonus in the contest if you want to be more creative. It sounds a bit silly, but this Easter egg hunt game can be extremely effective. Make sure that you have enough prizes to give out and remember that is acceptable to say that not every egg is a winner. Home Party Plan Games MUST Be Fun! Make sure your home party plan games are FUN. If it is not fun you will never get bookings. 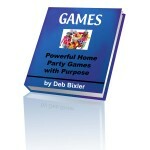 Download your free ebook with many fun Home Party Games.